Stuart Jones topped group 1 with a 53.664 edging out Daniel Taylor by just over a tenth. 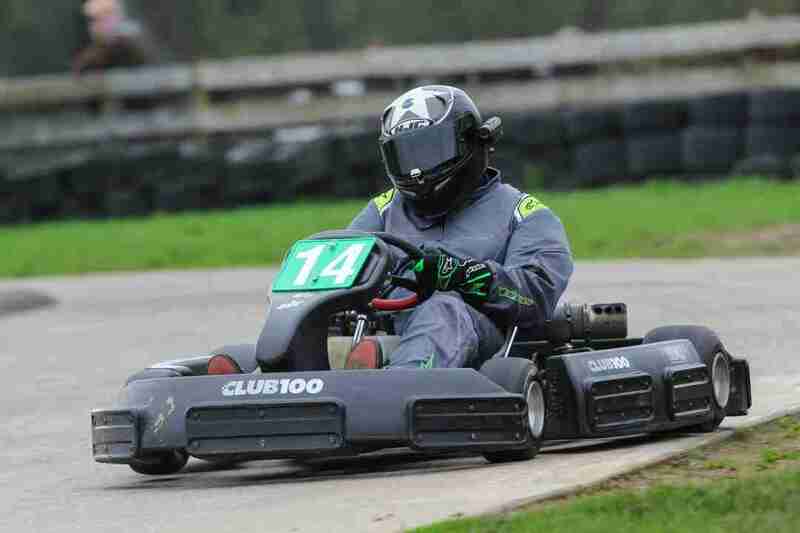 Steve Bosley was third quickest leaving it till his final flying lap to set his best time. 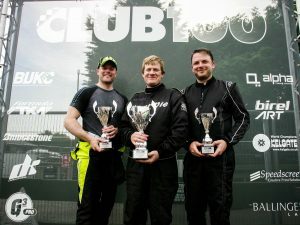 These three were the only drivers to break the fifty four second mark. Fourth quickest was leading SHW Trevor Randall. A fine effort this just edging out Miguel Hall by 0.078. 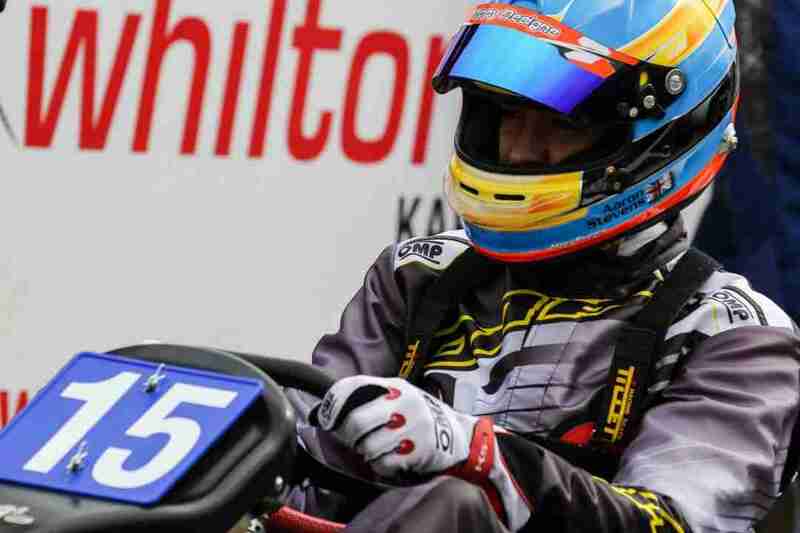 Championship leader Seb Algieri topped the group 2 times with his first flying lap and no one got close to his 53.534. Nick Trafford was next up, the only other driver in the group to get below fifty four seconds but still over two tenths away from Algieri. 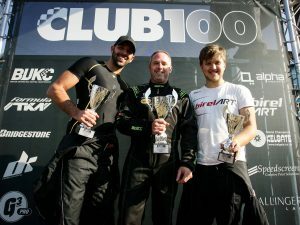 Mark Turner was a delighted third quickest from Michael Ballinger and Craig Brown with Championship contender Tim Hill a despondent sixth. SHW sponsor Stuart Germon on pole having just missed out on qualifying for the Pre A Final by just 0.055. Chris James would start alongside. SHW runners Jordan Salter and Peter Gillett shared row two with SHW Paul Williams alongside Nima Oparver on three. SHW James Edwards alongside Chris Scivier on four with the top ten completed by Mark Appleton and Martin Gurnett. Bit of a surprise to see Gurnett off the pace after his Clay exploits. Four to qualify as usual for the Pre A Final. Germon lead the field up to the start but it James who got the better traction to lead round the first couple of corners and up the hill. But Germon pulled out of the slipstream and calmly moved ahead at Christmas into a lead he would never lose. At one point he was over a second to the good but both James and Salter in third closed up over the latter stages but then settled down, happy to have qualified comfortably for the Pre A Final. But what of the final place. 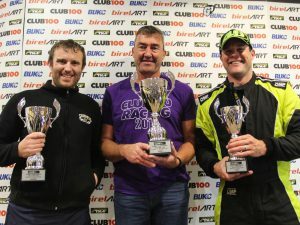 Gillett held the spot early in the race whilst Williams dropped to sixth behind Oparver with Gurnett running seventh. It took Williams several laps to get by Oparver but when he did he quickly began to reign in Gillett. At half distance Williams took fourth and that looked to have settled who would move up but coming out of Crook with just three laps to run he got wide and ran out of road. A daft error as he himself later admitted. Which left Gillett back in the qualifying spot. But not for long as Gurnett breezed by to take the spot. 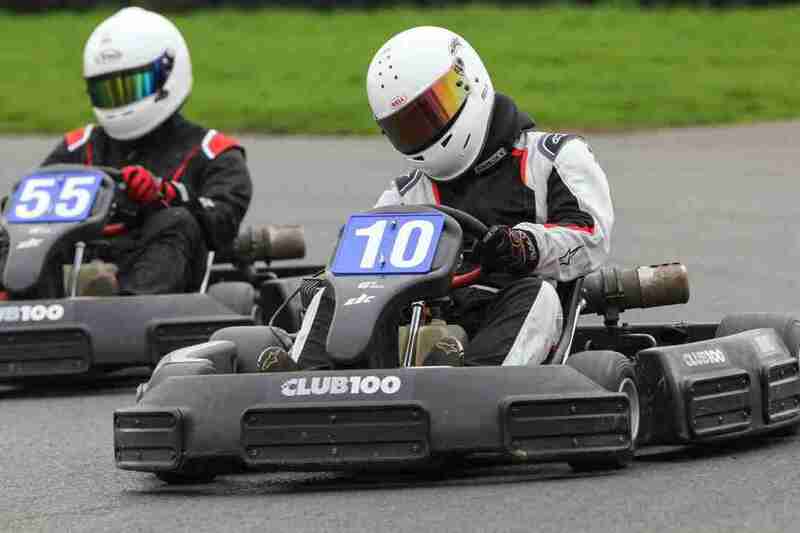 Scivier also took Gillett on the final lap to take a spot on the front row for the B Final. Kelly Rogers took seventh. A very good drive this up from grid seventeen. 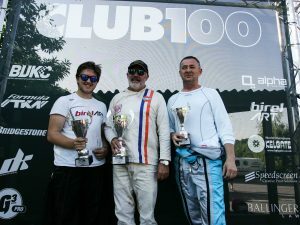 Edwards, Chris Sawyer and Stephane Appleton completed the top ten whilst Bodnar set the fastest lap of the race and Williams setting the fastest SHW time. Algieri on pole from Jones with Trafford and Taylor on row two. Bosley and Turner on three from SHW Championship leader Randall and Ballinger on four whilst Brown and Hill completed the top ten. Algieri got away to a good start with Jones tailing him up the hill towards Christmas corner. Trafford remained third but Bosley got ahead of Taylor whilst Turner and Randall held station. Brown and Hill both moved up a place as Ballinger dropped back. By the end of the lap Algieri was almost half a second up on second placed Jones. Trafford got a run on Jones up the hill and made the move stick into the corner but Jones was badly compromised and lost momentum. He would be down to sixth by the end of the lap. Algieri was over a second clear of Trafford with Bosley third from Turner, Taylor and Randall. Algieri continued to pull clear as the fight developed over second. Trafford still held the place from Bosley but Randall was into fourth ahead of Turner, Jones and Taylor. 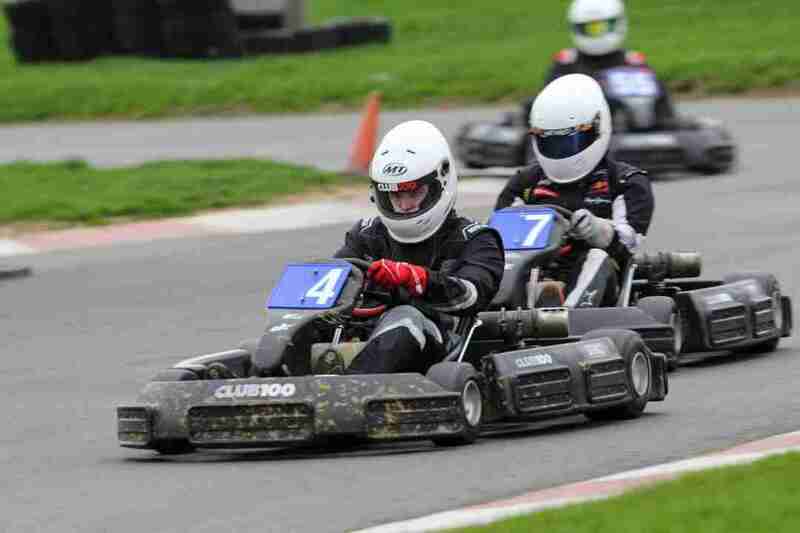 Brown was next ahead of Hill who was coming under pressure from Lennie Wood who had fought his way forward from grid thirteen. As the battle for third raged Trafford finally managed to break clear and began to set quicker times than the leader. Half distance and he was right with Algieri. As they ran down towards Chapman’s Trafford thought he saw an opening and dived to the inside. Too late he realised his mistake and tried to back out of it but he clipped the leader spinning him round. Out of the corner he looked back, lost more momentum and Randall slipped by into the lead. Only time will tell if this was a defining moment in the Championship. Algieri would resume but could only finish down in twentieth. Randall continued to lead with Trafford second but knowing he had a penalty. Bosley was third but Taylor was up to fourth ahead of Turner and Jones. Brown was next ahead of Wood and Hill. 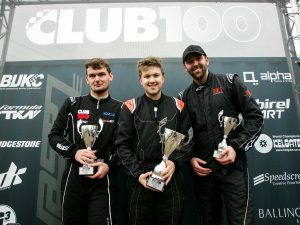 Randall took the win and sealed the EssexFlatPack SHW Championship, with Trafford second on the road but penalised down to tenth, promoting Bosley to second, Taylor to third, Jones to fourth, after getting by Turner at Christmas on the penultimate lap, Brown sixth, Wood seventh, Hill eighth from Daren Townsley. A good drive this up from grid seventeen. 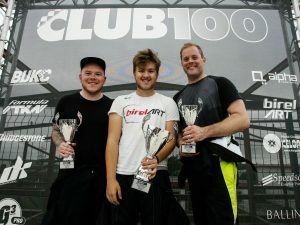 Jordan Salter was the second SHW ahead of Stuart Germon and Paul Goddard who had done exceptionally well to qualify straight into the Pre A Final. Post race and Seb Algieri was understandably distraught as indeed was Nick Trafford, his head slumped on the steering wheel. He accepted full responsibility for his failed pass and quickly found Seb to apologise. He could do no more and after a few moments alone Seb prepared to do battle once again. Tim Hill meantime had no idea what had happened to Seb and was genuinely shocked to find lady luck had smiled on him. In terms of the points it made little difference but crucially Seb would be starting at the back of the A Final whilst Tim would be nearer the front. Game on! Just the top two to qualify for the A Final. Chris Scivier on pole from SHW Gillett. Second row, Rogers and SHW Edwards with Sawyer and Stephane Appleton on row three. Mark Appleton and Rhys Collins on row four with Tristan Mackie and Jack Hollingsworth completing the first five rows. Scivier and Gillett both got away cleanly with Edwards third from Sawyer and Rogers. Edwards took just a lap to find a way past Gillett who then fell into the clutches of Sawyer. Sadly the two them got together with Gillett spinning out and Sawyer taking a penalty thus ending any chance of qualification. Rogers ran third for awhile but the driver catching the eye was Stephen Netting. Having started on grid twenty four he made his way swiftly up the order. But he had left himself with far too much to do. 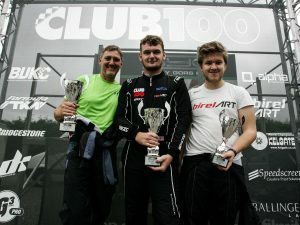 Scivier and Edwards settled into a nice rhythm and edged away from the rest of the field with Scivier taking the win and the trophy just seven tenths ahead of Edwards. 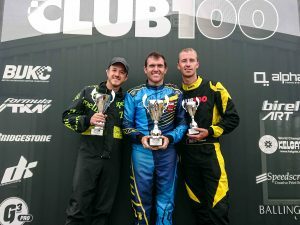 Netting took third with Bodnar fourth chased home by Williams who dropped to ninth after a penalty. Nima Oparver would have been next but he too was penalised. 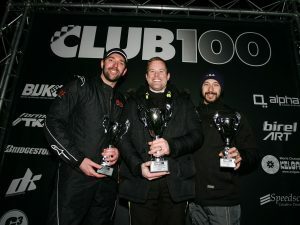 He did have the satisfaction of fastest lap thus handing Barney Langley fifth after a decent drive up from grid twenty. Richard Burrows also deserves a mention after placing seventh, up from grid nineteen. Randall on pole from Bosley with Taylor and Jones on two. Turner and Brown shared row three with Wood and Hill on four from Townsley and Trafford. 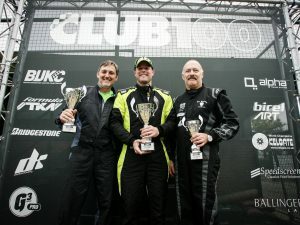 Randall led the field across the line bouncing up and down in his seat in an effort to get more momentum but it wasn’t enough and Bosley moved into the lead with Randal second and Jones up to third ahead of Taylor. Turner ran fifth ahead of Wood and Brown. Hill dropped to tenth behind Lammin and Ballinger. At the back of the field Algieri and Germon were both stationary at Inkermans ending Algieri’s hopes of useful points. Bosley continued to lead from Randall and Jones, the three of them gradually pulling clear of the battle for fourth headed by Wood from Turner, Brown, Taylor and Hill with the latter driving calmly and sensibly. Down the order, third in the Championship Trafford was in trouble for the second time in the day. He’d fallen from tenth to seventeenth before fighting back. Sadly he collected Gurnett in the process spinning the latter out and earning himself another penalty. Bad day for a driver who is not renowned for dirty tactics. Bosley, Randall and Jones continued to pull away as the battle raged behind. Wood was still fourth with Hill now up to fifth having picked his way carefully forward. Turner was sixth with Miguel Hall seventh from Ballinger and Brown. But Hall’s good run came to an end as he was punted out by Ballinger at Parker’s. Then Hill got by Wood for fourth as they ran up the hill just after half distance. But with the leading trio well up the road fourth looked to be as good as it was going to get. Valuable points though. Then we had a change at the front. Randall dived inside Bosley at the Boot but contact was made and Bosley held on to the position. But Randall sensed a win. Down into Ashby he got alongside. From my vantage point the move looked good but Bosley ran wide across the grass and Jones slipped into second behind Randall. Then Wood’s good run ended courtesy of Brown nudging him out at the final corner. Trafford had also worked his way back up the field and managed to make his way into the top ten. He would eventually cross the line in fifth in what would have been a stellar result had it not been for his eight place deduction. Randall crossed the line first but would be demoted back to fourth handing the win to Jones with Bosley second and Hill an unlikely third. Sometimes you need a bit of luck to win Championships. Turner placed fifth with James sixth. Another good drive this up from grid sixteen. 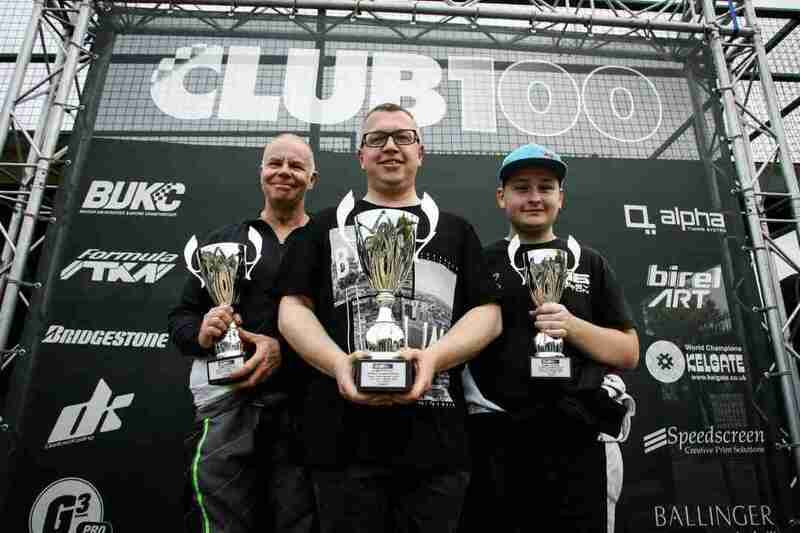 Taylor was next from Philip Charman, Aaron Stevens and then the second SHW Paul Goddard. A great result for him with Jordan Salter taking third on the SHW podium. The Heavyweights could not be tighter. 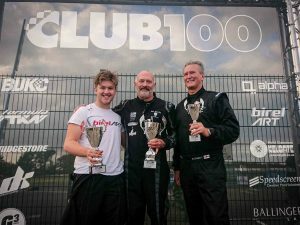 It could almost make film scrip with the oldest Club 100 winner, Tim Hill, up against the youngest winner, Seb Algieri. They are level on points with Tim at the top of the order by virtue of a greater number of wins. Halfway through the Pre A Final Seb looked to have one hand resting on the trophy but lady luck is a fickle mistress. Two spins, the first not his fault cost him dearly. But he was still smiling when he left the circuit. I suspect, despite Tim’s vast experience, that Seb may just be the more relaxed driver of the two heading to Buckmore. Nick Trafford remains third after a bad day. Two massive penalties ruined his results. But he only has himself to blame. And he did. 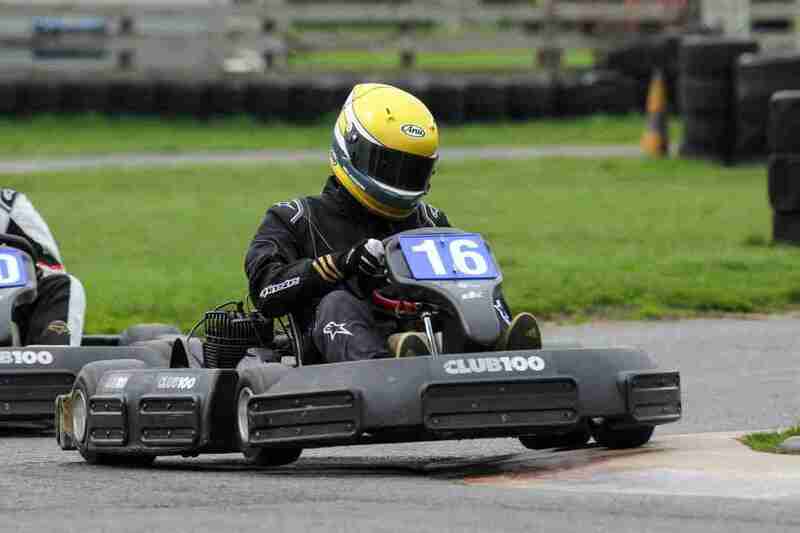 He’s a super quick driver and a top bloke. I think he just lacks a little experience and racecraft. But no matter, he’s having a great season. A win can’t be far off. Stuart Jones is now snapping at Trafford’s bumper for third place in the standings. 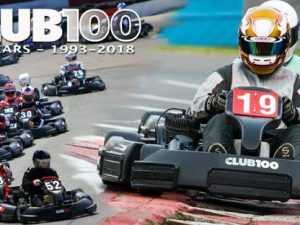 He thought his win at Whilton was a touch lucky. Maybe, but we all need luck now and again and he was there to capitalise on others errors. Trevor Randall and Steve Bosley are fourth and fifth. 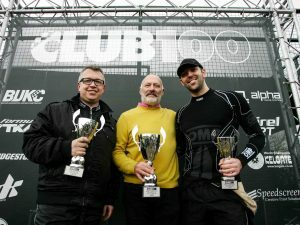 Trevor Randall wrapped up the www.EssexFlatPack.co.uk SHW Championship in fine style with his Pre A Final win. And he almost made it a double. I thought his penalty harsh so I am looking forward to watching it on the Alpha Live coverage. Trevor is a much more rounded individual these days in more ways than one and he accepted his penalty with a great deal more grace than he would have twenty years ago. Still a top driver though. Series sponsor Stuart Germon is second with Jordan Salter third.